» Home » Home » Dine » Join us for dinner! 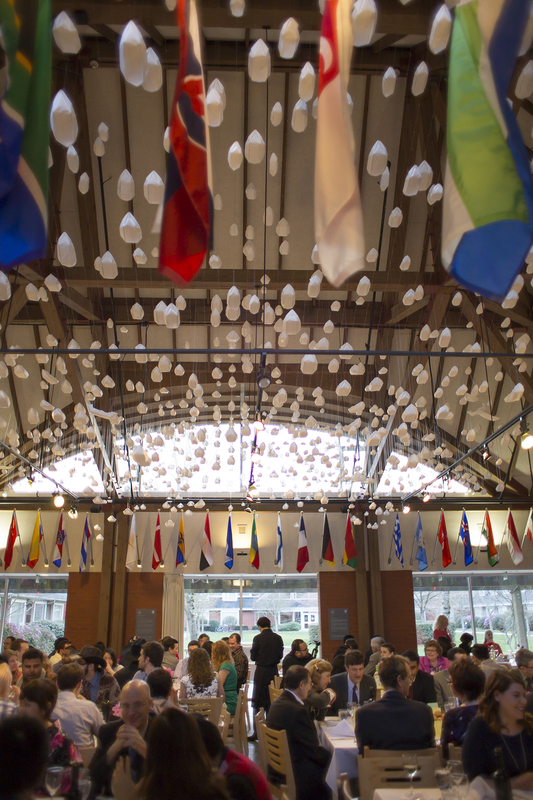 Our dining hall is an integral part of life at the college; it is over the dinner table that friendships are formed, and cross-cultural exchange and learning happens. Chef Clarence Tay and his team offer diverse dinner menus to reflect our diverse community and include abundant homemade entrees, vegetarian alternatives, and luxurious desserts. Members of the university community as well as the general public are welcome to join us for dinner and join the table conversation – or just enjoy some great food! The van der Linden Dining Hall has over 100 flags surrounding the room that represent the countries of the residents who have lived in our community over the years. Floating about the tables are over 1,000 paper boats that are part of art installation entitled, Waterscapes – Johannean Journeys. Our community is made up graduate students, post doctoral fellows and visiting scholars from all over the world, and there is usually a lively discussion happening somewhere in the dining hall. In fact we are pretty you may actually leave a little smarter after enjoying a dining experience at St. John’s! After purchasing a dinner ticket, a reservation will need to be made by noon of the business day prior to the dinner (i.e., noon Friday for Sunday dinner). Make a reservation with the Chef of SJC Culinary Service at 604.822.5857 or email sjc.chef@ubc.ca, leaving your name, telephone number, number of people attending, and any requirements for vegetarian meals. Why not purchase some tickets in advance and make dinner reservations as your schedule allows. We accept cash, cheque, and debit card. Breakfast tickets are also available for purchase for $5.00 and can be purchased in the St. John’s College Administration Office or the Dining Hall. Reservations are not required for breakfast. The menu for the week is determined on the previous Friday, and dinner includes salad, bread, entrée, dessert and non-alcoholic beverages. Beer and wine may be purchased with dinner.